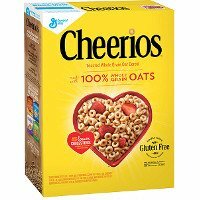 Cheerios has been a family favorite for years. Its wholesome goodness is perfect for toddlers to adults and everyone in between. Made from whole grain oats, and without artificial flavors or colors, they’re naturally low in fat and cholesterol free. These wholesome little "o's" have only one gram of sugar! Honey Nut Cereal is Very very good. It's very good. Thank you for making it. Kelly.